The stylish seated Arbours come in a variety of sizes and styles, perfect for any sized garden. Alternatively we have a number of Arches which can be used to frame a pathway within a garden or to separate different sections of a garden. What ever your taste both products are either traditional or contemporary in style to suit all customer needs. The are made from planed timber which is pressure treated to prevent against rot and decay. 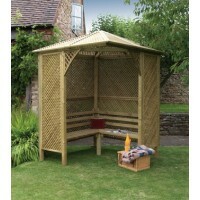 The Arbours and Arches are self assembly and come with full instructions and fixings required to complete your project. The Bow Top Arch is made from pressure treated pale green timber 2.5m (h) x 1.6m (w) x 0.6m (d.. 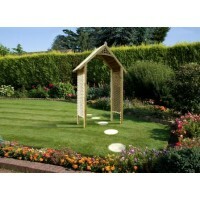 The Elite Arch is made from pressure treated pale green timber, this arch will span paths up to 0.89.. The Elite Granville Arch is made from pressure treated pale green timber 2.7m (h) x 1.27m (w) .. The elite portico arch is made from pressure treated planed pale green timber 2.2m (h) x 2.1m ..
Pressure treated timber 2.2m (h) x 1.43m (w) x 0.64m (d) ..
Pressure Treated Timber 2.1m (h) x 1.44m (w) x 0.63m (d) ..
Pressure Treated Timber 1.92m (h) x 1.8m (w) x 0.87m (d) ..
To add the finishing touches to your garden by having a beautifully designed arbour. 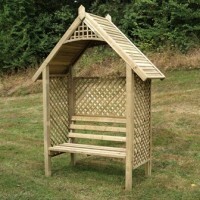 The Valencia Ar..
To add the finishing touches to your garden by having a beautifully designed arch. The Valencia Arch..
To add the finishing touches to your garden by having a beautifully designed arbour. The Valencia Co..